The auto model's world is moving fast in the last period, especially since the resin casting became a popular procedure in replicating them. We have a lot of players in this industry, a lot of projects and a high number of new releases from the usual models to the most eccentric ones. Every release is a challenge, first for the manufacturer, but for those who collect them in the same way. Personally, I like the unusual models of cars that you aren't seeing every day, so here my challenge begins with the first photo of a mold of the very exotic Ariel Atom V8, developed by a fresh name in the business, Soul models a Spanish manufacturer. The construction of the real car, scaled at 1:18 promised something more than the other resin made models. The usually „sealed body” or „not functional parts” terms mentioned along every new resin release had no sense here. Why? Just because the real car is technology at its highest level fixed on a tubular frame. No roof, no panels, no doors, no compromises like the engineers at Ariel said, only a skeleton looking body. What this means for a collector? Details! A lot of exposed parts to be replicated and to be put in the right places. What means for the producer, especially a new one? A lot of study and work, a long way from theory to practice. The technicians at Soul models developed this model after the car's original plans, under the Ariel team supervising and approval. 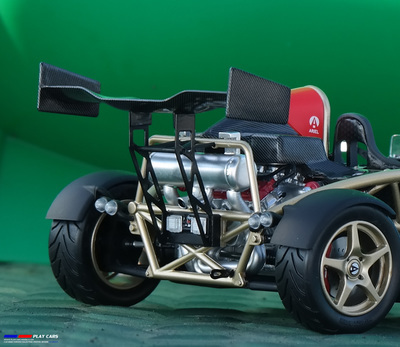 Is important to mention that they have the exclusivity and license for their product and nobody else will made other Ariel Atom V8 in 1:18 scale. Some final photos arrived to public last month and revealed a very interesting and good looking model, that will be available for orders from February and ready for shipment in March on their official site: www.soulmodelsweb.com. Must mention that the model belongs to a limited series of 1500 pieces, every model being individually numbered. As you know I constantly try to promote the Auto models Biography concept and the team at Soul models was interested in and very kind in offering for the first time, their final product for a close inspection here at Playcars. ​But, before starting let's make a proper introduction of this model, referring in a few words to the real car. First known as the LSC- Lightweight Sports car, was a project by Coventry University started by a student, Niki Smart. In 1996 the University chose to develop this project with input and funding from various automotive industry members, like British Steel and TWR. Responsible for this project was the senior lecturer Simon Saunders, the president of Ariel Motor Company. In October 1996, during the British International Motor Show the car was shown for the first time. Since 2000 the Ariel company decided to introduce the car to the public being the first exoskeletal road going car, named Ariel Atom. There have been seven generation of Ariel Atom to date, a 25 pieces limited edition called 500 V8 coming last. As you already guessed its propeller is a V8 engine of 500 horse power and is coming along with all technology finest: carbon body panels and aerofoils, chromoly aerofoil wishbones and a pneumatic 6-speed sequential gear box. Now, I won't go further with the real car analyse and I'll pass to the real subject of this review. At a first sight the box may appear quite large relative to the small size of the model. We have a cover black card box, printed with the manufacturer's logo and few safety instructions on its bottom. A classic and elegant look, designed to contain a second styrofoam box, meant to give a better protection to the model inside. Once opened, reveals the model, a true delight for those who want to get lost through complex shapes and details. It's fixed with 3 screws on a plastic base, independent of the rest of the confection. The car's name and again, the manufacturer's logo are printed on. Because of its structure, the model appears to be very fragile, but I assure you is very well put together. Anyway, handle it with care, especially when you try to unscrew it from its base. Once released, it feels heavy enough, but what is more important the eyes discover the assembling and detailing care around every part. I won't exaggerate when I'll say that the carbon pattern is the best I ever seen. Better than TSM's F1 XP where I was amazed by this detail. It has a precise and right texture, is bright and gives the right feeling for this model: technology. Our Ariel Atom is made of 155 pieces of plastic, metal or resin and 48 different stickers, being from what I know, the highest number of pieces ever used on a resin made model. They have made a considerable effort to bring this project to the end. Many parts were modified several times until their final result and this is easy to see and I'll explain you why. First, the gaps between parts are minimal, some assembly consisting of 2 or 3 different pieces appears to be a single piece until you look closer. I think I never seen the plastic parts made so precisley on a model. They keep a „clean” look, without molding residues or traces, often found at manufacturers with higher experience. „Serious fun” is the Ariel's motto and yes, is real fun to manage this model and try to discover all its secrets. Everything is developed around to the, so fancy called, exoskeletal chassis frame. It's resin made and the material includes the paint, so no issues at all. What I like are the joints welded and visible in the same way as on the real car. On the front side, the F1 inspired nose best reflects what I've said before: an assembly of several pieces put together perfectly, to look as a single part. The carbon spoiler and the superior cover of the model's nose are looking stunning! And if we are here is hard to not observe the suspension: the coilovers are developed as a single part but, the components are painted individually. I like that they replicated the fastening screw heads for the suspension. In the same area a photo etched metallic part reproduces the trigger of the fire extinguishing system. The front air intake consists of 2 distinct parts and let visible through, the cooling fan. Front lights are simple as on the real thing and attached without visible stubs. Although simple in appearance, the suspension arms consist of 4 different pieces for each front wheel. Moving to the back side, the things become quickly more interesting. The generous air intakes, one from each side, are modeled very well, the plastic looks qualitative and well finished as I already mentioned. Inside, the grills are replicated by metallic parts that received a black wash for a higher realistic note. And are looking awesome, indeed. The same thing for the third air intake, situated inside of the head protection zone. The V8 engine was developed as a single part, having some pieces individually painted and few visible hoses made of soft material. Looking carefully you'll be able to see the transmission modeled by black painted parts and again, the coilovers. I let for closing the strongest parts: the exhaust, developed individually and nice finished and put in evidence, the massive rear spoiler, carbon covered of course and its fantastic looking support system. To make that they used a metallic photo etched part, keeping the intriguing design from the original. And that's not all! The engine cover at least for me is a piece of art. 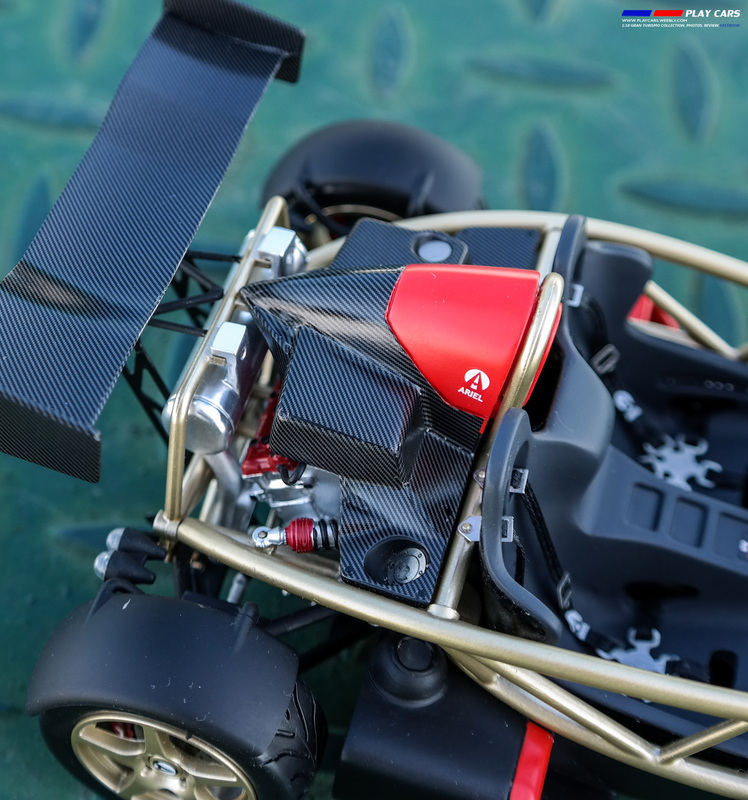 Its complexe shape was perfectly scaled and the carbon fiber on its edges never looked so good! The oil and fuel gaps are metallic photo etched parts, individually customized. Of course a complete set of lights and a tow hook were correctly positioned. Painted in the same color as the chassis frame, the Dymag ultra light magnesium rims are great replicas. Are keeping the correct design of their counterparts with visible shaped rivet heads and customized lug nut. Brakes are high level, too. The brake disks are covered by a metallic dimpled coat, along with the painted and marked calipers, exact copies of high tech Alcon brakes. Tires are keeping the right profile and marked side walls. Really good view here! Isn't a great effort to take a look into the cockpit to see how much the producer strove to create a high level product. The shell racing seats are beautiful finished and featuring textile made seat belts and metallic photo etched buckles. Even the fastening system was replicated on the same way. 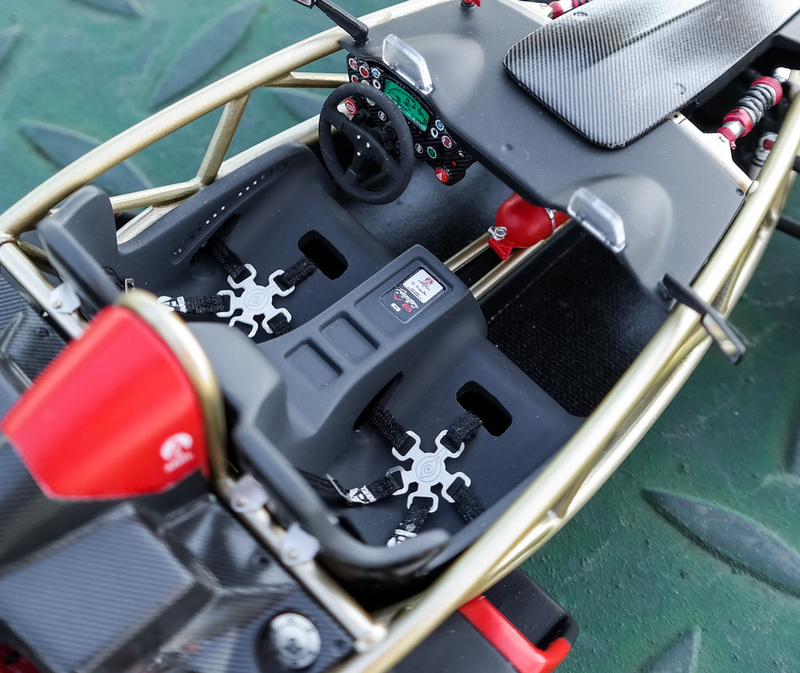 The very simple but, tech dash board is embodied by a carbon covered panel and all the buttons and switches were individually painted and marked. A rough material covers the 3 spoked racing steering wheel that looks very nice and keeps right proportions. The fire extinguisher is on its place, but is something else that amaze me here in the cockpit: the floor. Or better said, the way is made. Previously I've seen some photos of the real car and the floor texture is exactly the same on the model. Amazing job, is looking fantastic and I'm really in love with this detail. In addition to the sample presented in their first photos, underneath, the final version has received a decal with the producer logo and other one containing the individual number. Ok, is the time now to put the model at its place and have some conclusions. 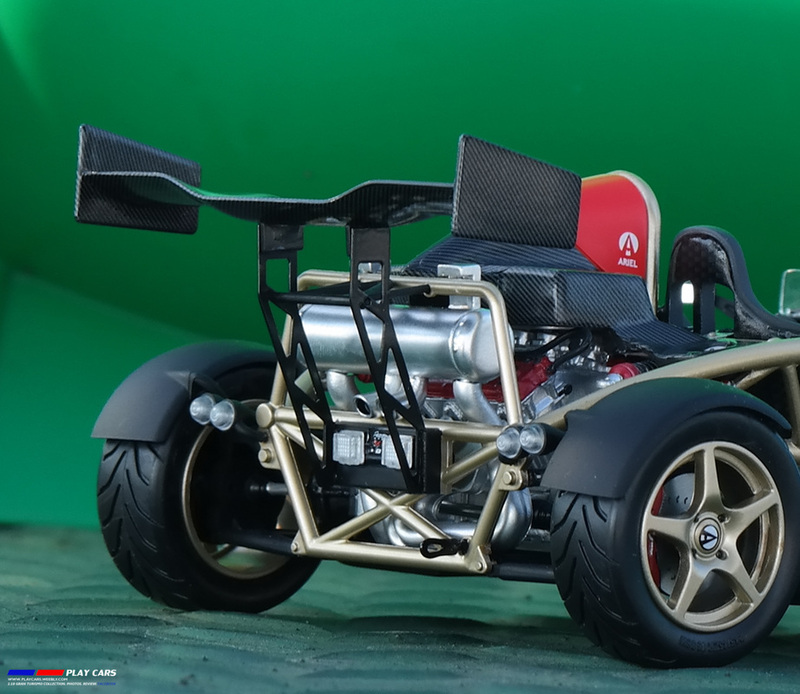 Ariel Atom is an impressive model that has much to offer for those who will choose to have it. Is it by far the best resin made model reviewed by me. Looking from the collector side I found here a great amount of details, quality of materials, caring for assembly and high level of finishing. Its unique presence makes it even more desirable. I was impressed by the work done on this model, especially thinking that was the first release of the team. I'm sure that you'll enjoy every part put together, the fascinating carbon texture, the chassis frame making its way through the myriad of details surrounding and at the end you'll feel as if you took part in creating it. Only now you realize that you had serious fun.